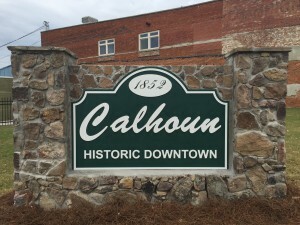 The Downtown Calhoun website has all the information you need to know about our downtown. It has event listings, business directories, access to our Facebook & Instagram links and much more. Visit downtowncalhounga.com today! The Downtown Development Authority works throughout the year to promote Downtown Calhoun as a great place to do business, be entertained, dine or simply relax in our beautifully maintained downtown. The DDA supports downtown businesses with various types of marketing and advertising throughout the year. The DDA is a Fast Lane sponsor of the Keep It in the County campaign that promotes shopping locally. A DDA FACADE Grant Program is also available to businesses in the downtown district, which offers matching financial assistance for renovations to downtown buildings. The DDA sponsors events at the newly renovated GEM Theatre and the Harris Arts Center to allow the community to enjoy professional entertainment at a reasonable cost. Events such as BBQ Boogie & Blues in the spring to Harvest Fest in the fall are available to the community at no cost. The Historic Preservation Commission has succeeded in obtaining National Registry status for the entire Historic Downtown Business District. The HPC will continue to strive to preserve our rich heritage. The Downtown Development Authority is a voluntary position appointed by the Mayor and City Council. Please contact Suzanne Roberts at 706-602-5570 for more information if you are interested in serving on this board when future opportunities arise. The Historic Preservation Commission is a voluntary position appointed by the Mayor and City Council. Members are City residents and persons who have demonstrated special interest, experience, or education in history, architecture, or the preservation of historic resources. Please contact Suzanne Roberts at 706-602-5570 for more information if you are interested in serving on this board when future opportunities arise. Error: Error validating access token: Session has expired on Friday, 19-Apr-19 08:54:27 PDT. The current time is Thursday, 25-Apr-19 21:45:16 PDT.